Siebel Systems founder Tom Siebel was charged by an elephant in the Serengeti while on vacation there. Early on the morning of Aug. 1, Siebel said, he and a guide went to a watering hole, where they hoped to observe a variety of game that were known to gather in the quiet early morning hours. They were watching a group of elephants from 200 yards away - "keeping a respectful distance," Siebel said - when one turned and without warning began to charge. "There was no apparent reason, nothing that should have made it feel threatened," Siebel said. "It was quiet, and then the quiet stopped," when the elephant began thundering toward the two men. As the massive animal closed the distance, Siebel said the guide fired a gun but missed. Siebel said he was trampled and gored in the leg, until he just "curled into as tight a ball as I could." The guide suffered broken ribs and other injuries. After the animal left and the men called for help, rescuers came and eventually airlifted Siebel to Nairobi, where he received emergency care before flying back to California for more treatment. All told, he said, he spent 18 days in four hospitals before he was allowed to go home. Siebel has been using a wheelchair but has told friends he expects to make a full recovery, after reconstructive surgery and physical therapy. 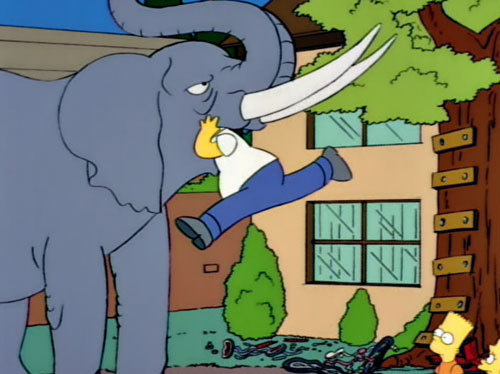 Seriously, how many people get to be attacked by an elephant and survive after that?